RQ Search and Replace is easy to use text replacement utility for Windows. 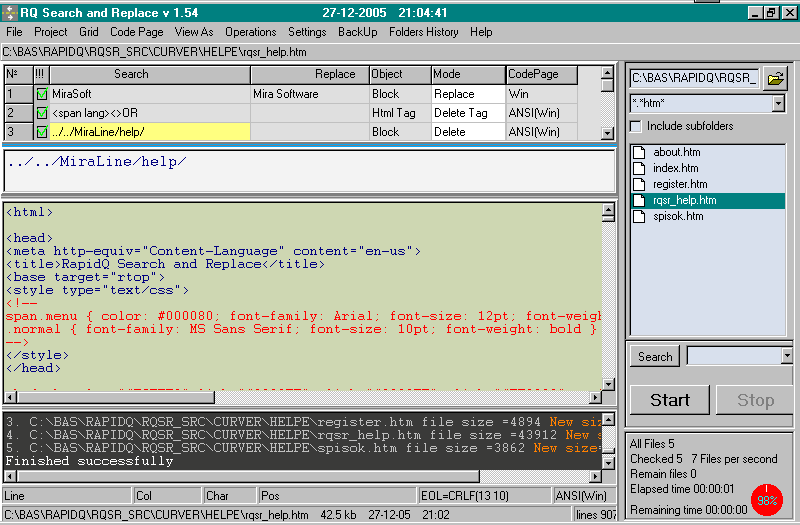 Main features: Search and replace (multistring) text bloks, whole words, "enclosed blocks", Html tags and attributes. Replace, delete, insert before.., insert after.. operations For html tags - delete tag and/or text in tag - delete or change tag attributes, by attribute name or value Powerfull backup manager provides safety of all replacement operations. Search and replacement patterns are stored in the string grid. You can drag-n-drop patterns from the built-in editor to the string grid. The string grid can store multiline patterns. Simple text search utility for Windows. Qweas is providing links to RQ Search and Replace 1.54 as a courtesy, and makes no representations regarding RQ Search and Replace or any other applications or any information related thereto. Any questions, complaints or claims regarding this application RQ Search and Replace 1.54 must be directed to the appropriate software vendor. You may click the publisher link of RQ Search and Replace on the top of this page to get more details about the vendor.